The first mention of the cupcake can be traced as far back as 1796, when a recipe notation of "a cake to be baked in small cups" was written in American Cookery by Amelia Simmons. In previous centuries, before muffin tins were widely available, the cakes were often baked in individual pottery cups, ramekins, or molds and took their name from the cups they were baked in. This is the use of the name that has remained, and the name of "cupcake" is now given to any small cake that is about the size of a teacup. The name "fairy cake" is a fanciful description of its size, which would be appropriate for a party of diminutive fairies to share. While English fairy cakes vary in size more than American cupcakes, they are traditionally smaller and are rarely topped with elaborate icing. No matter where you live, I'm sure that there are plenty of highly skilled cake makers producing a huge range of imaginatively flavoured, beautifully decorated works of art. Whenever I went over to my in-laws house, my mother-in-law (who sadly passed in 2011) always had home baked treats and goodies...she inspired me in my late 20s to take up baking with a passion. It became a running joke amongst my friends and family that I would never turn up without some baked treats for them to test and tell me what they thought. Yumm! Bakery grew slowly as a pipe dream over many years of people telling me I should sell my cupcakes. That eventually grew into something more during a long exciting talk with my husband on a Sunday, and by Monday morning Yumm! was born. Do you research - find out who your competition is, what their pricing is, who they target and how you can make yourself a little different. I think this is such an important step that a lot of people over look. You have to know your competition. 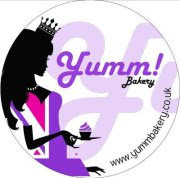 I would like to be a cupcake brand in Glasgow - a company that sits along side some of the well known Glasgow Cupcake Companies that people know. And maybe a shop! This is so difficult because everything I bake I love, that's why I make them. I have recently started selling CakePops which I am a little in love with because they taste amazing. But for me I think its got to be my Caramelised Banana Cupcake with Peanut Butter Frosting it tastes so moreish...YUMM! Originally I had a whole answer about Robert Pattinson because I think he is gorgeous, but when I read back my answers I realized that it wouldn't be R-Patz and I couldn't pick just one person. I would have to have the people I love most - my family both those with me and those who have passed. I know this is cheating but I figure its my last meal I can be a little difficult & demanding. To eat? It would have to be cupcakes of course! A couple of weeks ago when I was helping LittleGems Jewellery at a craft event, Pamela and Yumm! Bakery were set up on the stall next to us. With a massive collection of cupcakes and cake pops on offer, it wasn't easy to pick one to take home, so I picked two instead! The cupcakes above were both fantastic. 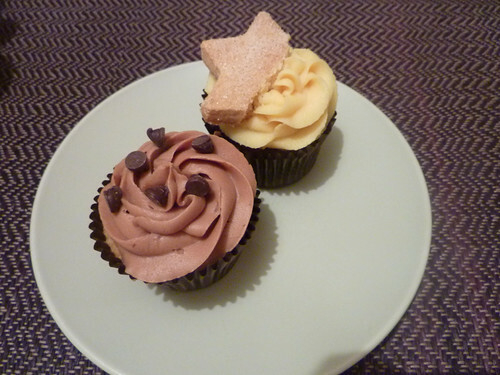 The cake with the star on top was salted caramel with a home made cinnamon shortbread star and the other is a maple choc chip, which was my favourite. Yumm! can deliver fresh baked cupcakes to your home or workplace across Glasgow & Lanarkshire. Check out the website for more details or keep up to date on Facebook or Twitter.